Calling this latest version of RealWorld software "Paint" (free) is underestimating this program, to say the least. It's like calling your computer a typewriter: Some people still use it like one, but it can do so much more. RealWorld Paint imports and exports Photoshop, The GIMP, and Paint.NET image files, including layers, as well as standard image files (.jpg, .png, .bmp, .gif, etc.) so can be a functional part of your illustration arsenal. RealWorld Paint v2011.1 is all about pixels. There's no option for vector graphics, which is not a problem for most image manipulation, but RealWorld Paint is not a replacement for Adobe Illustrator ($599); Xara Designer Pro ($299), or Serif DrawPlus ($100) Illustrator's budget competitors. That said, if you are not looking to create resizable graphics, don't mind working in pixels rather than on pages, but have a super-juiced system, RealWorld Paint may be just what you are looking for. RealWorld Paint has three main focus areas: the image manipulation tools, the painting tools, and the animation tools. The image and painting tools work seamlessly, allowing you to remove red-eye, clone stamp over unwanted areas of your image, and change levels/brightness/contrast before painting and drawing on your additions. Much like Xara Designer Pro, which also bundles Photoshop-type tools with its painting and drawing tools, RealWorld Paint makes it really easy to select areas of the image and accurately lighten, blur, or remove those pixels without much effort. Personally, I've never understood why Adobe Photoshop makes it so difficult for a noob-user to figure these things out. While using RealWorld Paint, I did keep searching for a "select" tool, and found it frustrating that I couldn't cut and paste pieces of my painting into different layers---one of the perils of raster design, rather than a failure of Paint, however. I also miss the eye and padlock icons used to hide and lock layers in Adobe's Creative Suite, Xara Designer 7, and Serif DrawPlus. RealWorld Paint's layers palette is one of the highlights of the program. My favorite button allows you to "emphasize current layer" and with a single click the full image is transparent with only the current layer completely opaque. Applying effects to each layer makes creating beautifully and artistically textured and lit objects a breeze. RealWorld Paint includes effects like Shadow, Glow, Satin, Fill, Bevel, and Shadow properties within the layers, and in addition you can use Photoshop plugins. You can keep adding special effects to the layer until you get the result you envisioned. The trick here is to use the effects in the right order: for example if you bevel after applying a drop shadow, you end up with your drop shadow looking very strange; and if you accidentally add something else to that layer---say an artistic border---the effect is applied to that addition too. My main problem with RealWorld Paint was that it was so sluggish running in both Vista and Windows 7 (I didn't try it in XP or Win 2000) it was almost painful: With multiple large images, layers, and layer styles, it gobbled up to 1GB of RAM. The program didn't hang or crash, however, so the slowdown is something I could almost overlook because of Paint's ease of use and cool built-in effects. If you need to forego the slick, easy-use effects for speed, then try Paint.NET, another free painting program that takes longer to learn but runs leaner using Microsoft's .NET Framework. If you are looking to be creative with your images, or want to create professional looking graphics and animations for blogs or websites, RealWorld Paint is definitely a real-world contender. If you have any prior experience with image manipulation or design programs, you'll pick RealWorld Paint up really quickly and wonder why you didn't have to pay for it. 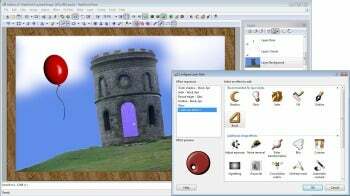 Manipulate photos, paint, draw, and animate raster images with free RealWorld Paint.